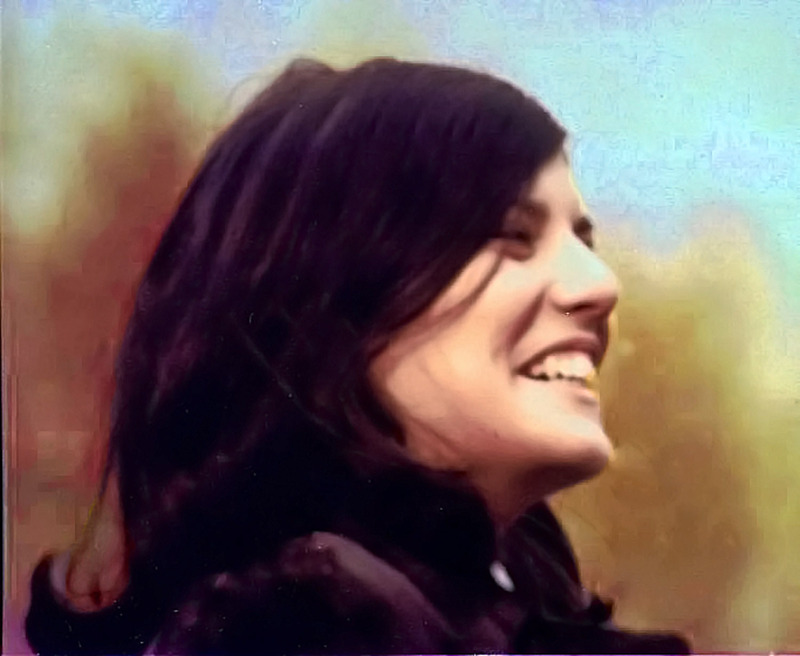 My sister Allison Krause was killed at Kent State on May 4, 1970. I co-founded the Kent State Truth Tribunal with Emily Kunstler and we opened our doors for the first of three tribunals last year right around this time. 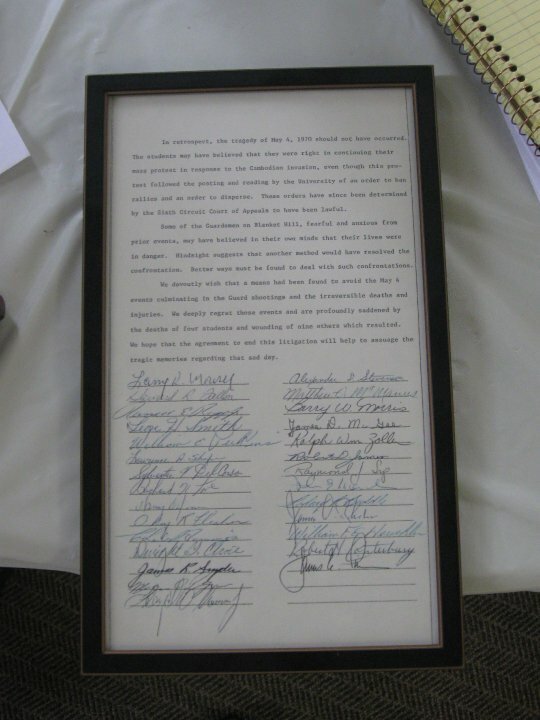 On May 1-4, 2010 we recorded, preserved and honored the stories of original participants and witnesses of the Kent State shootings on May 4, 1970. It was a blessing that my mother Doris Krause, 85, was able to be present for the beginning of the Kent State healing. 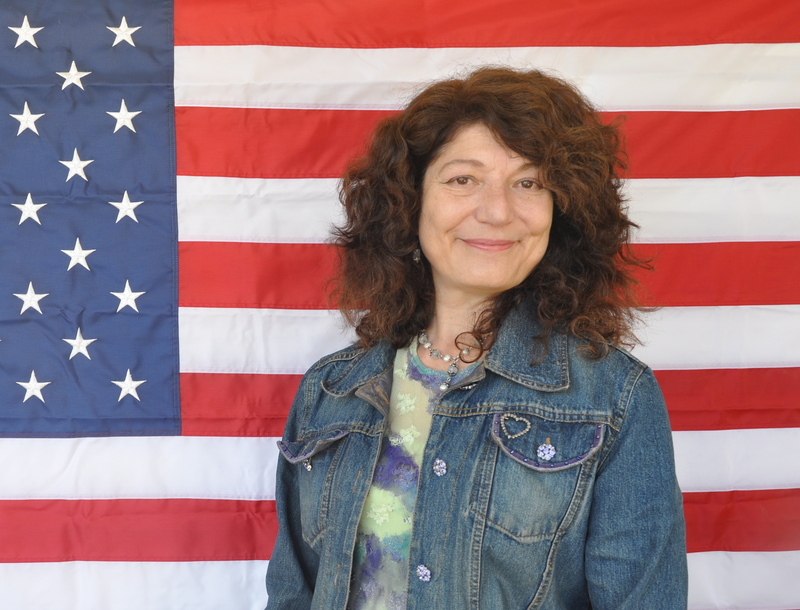 As I returned to my home in California, I received word from Mom that the Kent State Tape had been examined for the very first time and a story was breaking in the Plain Dealer tomorrow, article here http://bit.ly/aM7Ocm That she had given a quote applauding the news of this long-denied order to shoot. That it had been analyzed and verified by Mr. Stuart Allen, a top forensic scientist (also Stuyvestant colleague of General Holder). Looking back on my Kent State path, I was 15 years old when Allison was murdered. For nine years after, my family life and world were also blown apart forever, especially as my folks pursued justice for Allison in the courts. Mr. President, no one from the government ever came to help us, except for Senator Ted Kennedy, and now recently with Rep Dennis Kucinich. Recollecting those horrible years, I remember my Dad entering the Kent State Tape into evidence in his lawsuits. Lots of folks called Dad Krazy Krause, he would not let this go. 40 years later, it was heartening to realize Dad knew that the tape held the key to the truth at Kent State. It has taken us over 40 years to be able to decipher and once in for all, hear the recorded sounds via Mr. Stuart Allen’s expertise and kgb audio software. 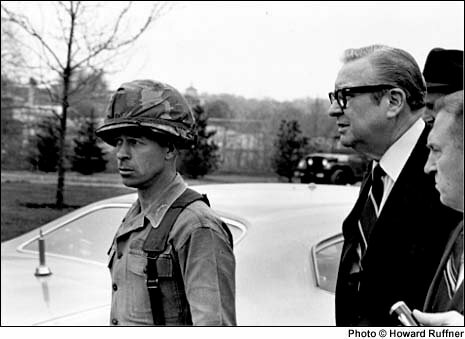 Mr. Norman is one of many present that day, cogs in the wheel delivering four homicides on May 4, 1970 and crossing the line at Kent State, yet Mr. Norman’s actions directly connect the FBI with the command to fire. Mr. Norman’s actions prove the intent to create, as in instigate sniper fire 70 seconds before the guard shot. Now we understand the odd ‘Alright’ in the ‘command to fire’ order. It is for this reason that I formally request you Mr. President examine the new evidence in this cold case homicide of Kent State. Furthermore I ask you to create an impartial and unaffiliated team to investigate the F.B.I. This is the same instruction I gave Congressman Kucinich. From Wikipedia: Impartiality is a principle of justice holding that decisions should be based on objective criteria, rather than on the basis of bias, prejudice, or preferring the benefit to one person over another for improper reasons. Mr. President and General Holder, please examine the new evidence in the Kent State Tape. Yesterday on the Internet I discovered Arthur Krause’s words from 1979 and wish to share them with you. 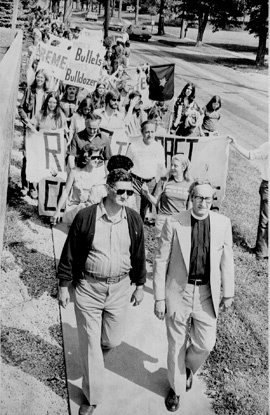 Here’s a picture of united Kent State, May 4th folks at a press conference, taken at the end of their nine year search for justice through the judicial system. Arthur and Doris Krause have mixed feelings about the 1979 settlement. “We don’t want the damn money ~ we want the truth. If we had wanted the money I would have accepted the one and a half million dollar bribe I was offered to drop the civil suit, offered to me in the presence of Peter Davies in 1971. A congressional probe into new revelations about the Kent State University shootings will be hampered — or may be curtailed — by voters’ decision Tuesday to hand Republicans control of the House of Representatives. Cleveland Democratic Rep. Dennis Kucinich had launched an inquiry in October into the May 4, 1970, killing and wounding of 13 students and Vietnam War protesters by Ohio National Guardsmen. The notorious incident hardened sentiment against the war, while also raising national alarm about campus unrest. Kucinich, who chairs a House subcommittee with oversight of the FBI and the Justice Department, began the inquest after The Plain Dealer published articles containing new details gleaned from a long-forgotten audiotape of the shootings. Though he won re-election Tuesday, Kucinich will lose his subcommittee chairmanship and its investigative power when Republicans gain control of the House in January. His office was scrambling Wednesday to adjust the inquiry’s timetable to the suddenly looming deadline. A forensic audio expert who examined the 40-year-old recording earlier this year at The Plain Dealer’s request, using modern sound-filtering and analyzing software, reported hearing an altercation and four pistol shots roughly 70 seconds before the Guardsmen opened fire, and later, a male voice commanding the Guard to prepare to shoot. Previous investigations had determined that the Guardsmen wheeled and fired spontaneously, even though they were not at imminent risk. Some Guardsmen claimed to have heard an order to fire. Others reported reacting to pistol shots, possibly from a sniper, though much more immediately than the 70 seconds that pass between the apparent pistol shots on the tape and the Guardsmen’s volley. No officer ever admitted issuing a firing command, and none of the criminal, civil or independent reviews identified anyone other than Guardsmen as having fired their weapons. It is difficult to determine how, if at all, the apparent altercation and pistol shots and the subsequent firing command captured on the tape are related. The violent confrontation between members of the protest crowd and someone – with shouts of “Kill him!” and “Hit the [expletive]!” – are followed by what forensic audio expert Stuart Allen believes are four shots from a .38-caliber revolver. After The Plain Dealer reported the latest findings, some speculated that the altercation involved Terry Norman, a Kent State law enforcement student who was carrying a .38-caliber Smith & Wesson pistol during the May 4 protest rally and was taking photos of demonstrators for the university police department and the FBI. Norman claimed he was assaulted by crowd members angered by his picture-taking and told investigators he drew his gun to warn them away. But he denied firing, and insisted that the dust-up happened after the Guard gunfire, not before. Several witnesses said they heard a Kent State policeman who inspected Norman’s pistol exclaim that it had been fired four times. The officer later denied making the remark. An FBI lab test determined the gun had been fired since its last cleaning, but could not pinpoint when. 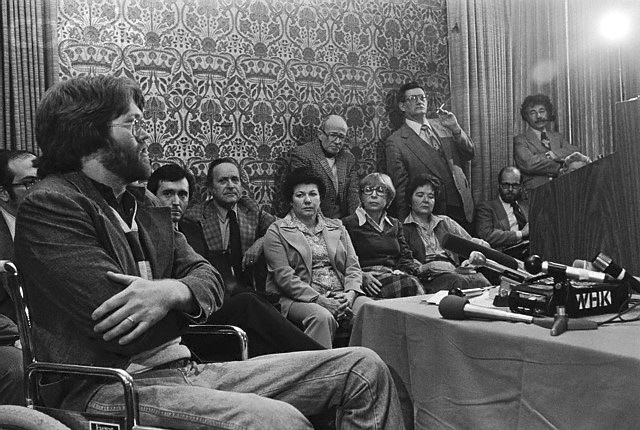 In 1973, then-U.S. Sen. Birch Bayh pressed the Justice Department to look into Norman’s activities, saying he may have been the catalyst for the Guard’s shootings. 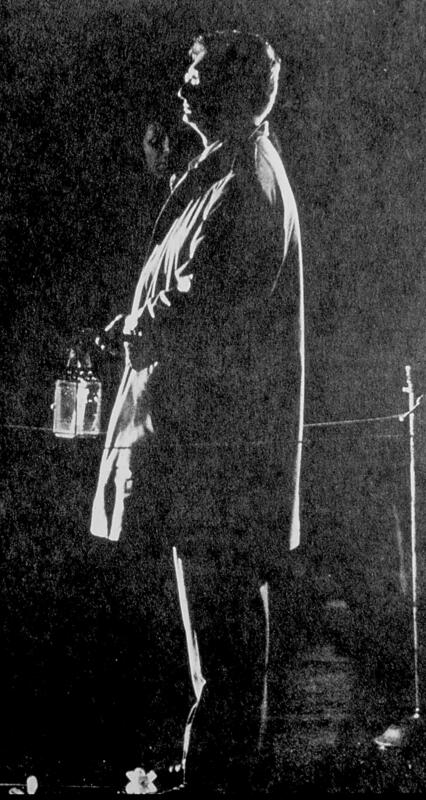 A federal grand jury questioned Norman in December 1973, but he was not charged. “As far as we were concerned at the time, [Norman] was a non-issue in the overall events of what happened that day,” Robert Murphy, the Justice Department lawyer who led the grand jury probe, said in a telephone interview Monday. The grand jury indicted eight low-ranking Guardsmen on civil rights violations for the shootings. A federal judge later dismissed the charges (pdf). Norman joined the Washington, D.C., police department several months after the Kent State incident. His precise whereabouts today are not known. Kucinich has asked the FBI to produce records that might show whether Norman was working as a confidential informant or some other capacity, and whether the bureau helped him get the D.C. police job. He has said the subcommittee will attempt to locate and interview Norman, and that he may be called to testify. 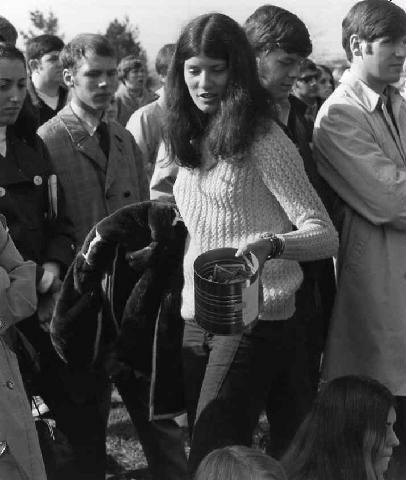 In addition to the House inquiry, the Justice Department’s civil rights division is weighing whether to re-open an investigation of the Kent State affair based on the potential new audio evidence. No decision has been reached, a spokeswoman said Wednesday. Cleveland attorney Terry Gilbert and Alan Canfora, who was wounded by the Guard’s gunfire, recently met with Assistant Attorney General Thomas Perez and U.S. Attorney Steven Dettelbach to discuss the possibility of a renewed federal review. Gilbert said the department’s inspector general, for example, might be able to provide an impartial, independent review of the FBI’s role at Kent State. The political changeover and its potential effect on Kucinich’s investigation of Kent State is a setback, Gilbert acknowledged, but he remains optimistic.